Greenpeace has documented the gradual melting of the remaining Pyrenees glaciers and estimates that they could totally disappear within the next fifty years. 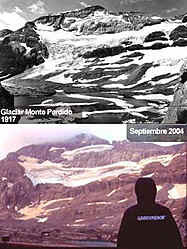 Photographs have recently been taken of the Perdido glacier (Ordesa y Monte National Park) to compare with those taken at the same location in the early twentieth century. The evidence suggests that the surface of the Spanish Pyrenean glaciers has reduced from 1,779 hectares in 1894 to 290 hectares in 2000. This supposes an ice surface loss of 85% in little over a century, with melting clearly accelerating in the last 20 years. Providing convincing evidence for global warming, there has been a reduction in ice mass of 52% in only 20 years (from 1980 to 2001), and 30% in the last decade (from 1991 to 2001). If this tendency continues, there will be only 9 hectares left by 2050.